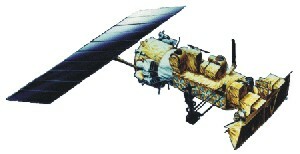 This is a picture of the NOAA AVHRR satellite. NOAA stands for the National Oceanic and Atmospheric Administration run by the United States government, and AVHRR stands for Advanced Very High Resolution Radiometer. The spacecraft flies at approximately 20,000 mph above the earth at an altitude of about 500 miles, and simply circles the earth about the poles. It flies overhead every 12 hours. Since it’s only 500 miles up, it can only see small pieces of the earth at a time (the red band on the globe). We begin gathering data from it once it rises above our horizon, and stop collecting data when it drops below the next horizon (see the horizon image). 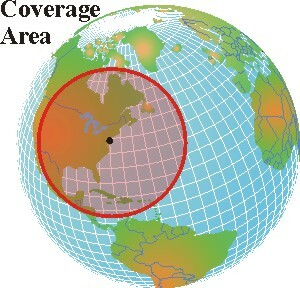 The total coverage area (shown below) is the area we can see on any given day. 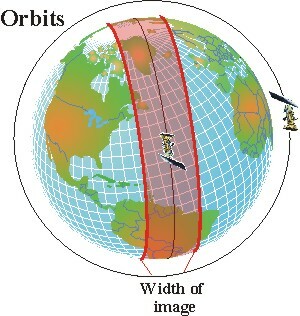 The satellite “sees” the earth somewhat like we do, looking at visible light (red, orange, yellow, green, blue, violet). But, it can also see temperatures, which is what we use it for. At any given time, there are usually three of these AVHRR satellites up in orbit, and we track all three of them here at the COOL room. That gives us 6 passes over New Jersey each day.